Every travel – wonderful and exciting event, which can fulfill your dream and allows your body and minds to rest. But every tourist has his own opinion about perfect travel. Somebody prefers sunny beach, somebody likes reach group excursions’ program. Meantime, great number of active and independent people in the world chose a travel by the car. 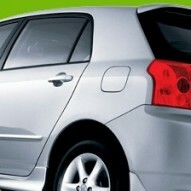 That’s why car rental is considered as one of the most popular aspects in travel business. Just upon arrival at the beautiful and ancient Tbilisi tourist realizes that a quantity of interesting places is huge. Renting of car – is a real opportunity to see this wonderful city, visit different attractions, monuments etc. This service is very comfortable and useful for everybody who wants to learn something new and enjoy the life. Car rental is also a great help for persons who came to Tbilisi for business trip and try to economy their time for city transportation. Rent of reliable and attractive automobile – isn’t just comfort and efficiency, but also a part of image for serious businessman. Usually, every rent agency has a quit wide auto park of cars. There is good chance to choose a car due to personal taste – manual or automatic transmission, luxury of business class. It’s possible to select a number of passenger seats, engine capacity and even car’s color. So, every client has an opportunity to use the most suitable car.